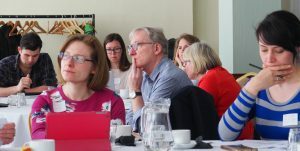 IHBC’s May ‘Council+’: Ideas bear fruit, as early career members ‘reverse mentor’, generating fresh perspectives on your institute’s future plans and structures! At the meeting of our Council+ last May, early career members of all categories provided fresh perspectives, alternative priorities and more relevant approaches to how the institute can support modern conservation practitioners, as they ‘reverse mentored’ our most senior officers, generating ideas and plans to help guide our forward planning and future structures. May’s Council+ (pronounced ‘Council plus’) saw more long-standing members of your institute grouped with younger members so they could be pointed towards new forms of advocacy and communication, and gain a better understanding of how to respond to current trends in practice and learning from those faced with modern career paths and employment circumstances. At the same time, early career members gained new skills and expertise, and enjoyed new insights into the strategic planning and leadership of the IHBC. Mentoring partners learnt from one another, while newer members were encouraged to contribute with confidence. Concluding the mentors’ main messages, they suggested priorities and direction for the future of the IHBC and its ever-expanding member focus. In particular, the IHBC was urged to take on board the reality of careers in the ‘new economy’, where few employers pay for fees & fewer people have time to volunteer. Many more recent IHBC initiatives came in for fulsome praise, especially the more inclusive direction and early-career focus linked to IHBC+ initiatives. In particular too, one key innovation that was recognised was Council+ itself, and that was endorsed as a great way to support and enhance direct involvement with the IHBC. In addition, the new MATE sessions – the Membership Application Training Events – were heartily welcomed. This innovative approach developed through the IHBC’s TeamStarter programme, piloted in Aberdeen under the IHBC’s former Education Secretary, Bridget Turnbull. The IHBC was felt to be very welcoming at Branch level but more could be done to welcome new members. Getting new members directly engaged with IHBC as soon as possible was see as the key. After that the Institute needs to strive to retain these new members and keep up active contact and reinforce early interest. This more focussed approach to CPD and audience priorities had been piloted already in the Belfast School and in the planning of the linked Yearbook, including more substantial online CPD support strategies for the School. It is now being taken forward in the development of the 2019 School in Nottingham, with a very tight competence based programme being drafted with the East Midlands Branch and consulted on widely. With so much material available the website (30,000 pages!) mentors sought better signposting to make it easier to drill down. With changes being made to the IHBC website all the time comments on making it more user-friendly, attractive & intuitive are encouraged. The pros and cons of establishing a ‘Young/Early Career’ IHBC Group, which were debated without a clear conclusion either way; whilst it could make IHBC more accessible to younger people and early career practitioners, it could also perpetuate the gap between older and younger members. Social media often was not used professionally by many younger practitioners, who tend to keep their professional and private lives separate, a point that the IHBC will build into its own forward planning.